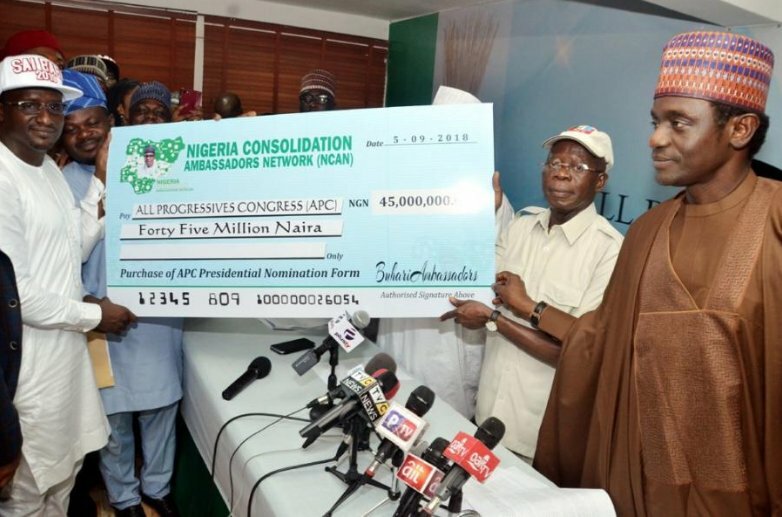 A group, under the auspices of National Consolidation Ambassadors Network (NCAN), has bought the All Progressives Congress (APC) N45 million Expression of Interest and Nomination Form for President Muhammadu Buhari’s re-election bid in 2019. National Coordinator of the group, Sunusi Musa, made the presentation to the national leadership of the party, at the national secretariat, in company with their members. “We are members of NCAN (and) our resolve, since our formation over a year ago, is primarily to ensure that president Buhari seeks another term as well ensure that the president emerges victorious in the 2019 poll. “Our reason for embarking on this project is based on the recognition of the fact that the president has started laying a foundation for a better Nigeria and there is need to consolidate on the gains so far made. “It is for this reason, we pride ourselves as Network of Consolidation Ambassadors. From September 2017 up till April 2018, NCAN was in the forefront of calling on president Buhari to seek re-election; in order to consolidate on the good work he has been doing, by building on the foundation he has laid for a prosperous Nigeria. “As God will have it, Mr. President acceded to the voice of reasoning and declared his intention to seek re-clection in 2019. We believe in the leadership of president Buhari; we can count on him to consolidate the good work he has started for another four more years. “It is for this reason that we have decided to pull our meagre resources together and purchased the Expression of Interest and Nomination Form for president Buhari as he presents himself to our party members; to be chosen as its candidate for the 2019 presidential election. “Our members, from various villages, local governments and states, have contributed to making this happen. “It is my singular honour and rare privilege to present to you a cheque of N45 million, as payment for the Expression of Interest and Nomination Forms for president Buhari,” the group said. In his response, APC National chairman, Adams Oshiomhole, said it would not have been a celebrated event were it not for the fact that it was the first presidential form the ruling party was selling.